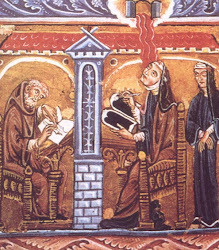 For today’s Feast of St. Hildegard of Bingen, Doctor of the Church (d. September 17, 1179), I have composed this chronogram and prayer. It reflects several images and themes from Hildegard’s last major work, the Liber Divinorum Operum (Book of Divine Works, LDO). The central one is Hildegard’s interpretation of what it means to be made in the image of God (Gen. 1:27). For her, this image is the eternally predestined “tunic” (tunica) or “garment” (indumentum) of the Incarnate Christ—that is, when God created humankind, he did so with his eye fixed squarely on the fact that the Son would one day be clothed in human flesh. Third, this prayer invokes Hildegard’s idea that humankind is itself the Work of God (opus Dei). In being made in his image and likeness, we are granted his own rational capacity to create, and thus also his own rational mission to create and to love. When God rested on the seventh day of creation, it was because the potential for dynamic activity had shifted from God to his Work, from creating Word to incarnate Word: “as on the seventh day God rested from his every work and then established humankind to take up the work, so in the Virgin’s womb he made his Son to rest, and to him he committed his every work” (LDO III.4.3). Finally, Hildegard perceives an inherent balance to all aspects of existence, stretching from the evenly matched spheres of black and bright fire that encircle the cosmos, down through the balance of the humors in the human body that keep it in health, to the essential virtue of discretion that keeps the moral life in equilibrium. For any part of existence—physical or spiritual—to get out of whack is for it to deviate from its created purpose, and thus also to deviate from its Creator. So, as we carry out the divine work entrusted to us by the God-who-became-Man, we must strive to keep it right, straight, and in balance. 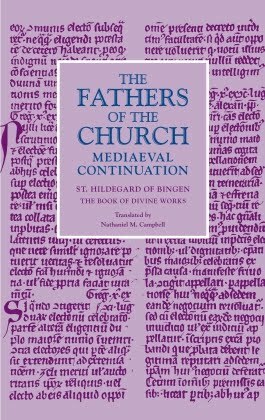 Note: All quotes from the LDO come from my forthcoming translation of the book, which will appear from the Catholic University of America Press's “Fathers of the Church: Medieval Continuation” series next summer. The chronogram is an epigrammatic form where, if you take all of the letters that are also Roman numerals (I, V[U], X, L, C, D, and M, which are capitalized in the prayer above) and add their values together, the result is the year you are commemorating. In this case, 2 D’s = 1000, + 7 C’s = 1700, + 4 L’s = 1900, + 1 X = 1910, + 17 V’s = 1995, + 22 I’s = 2017. 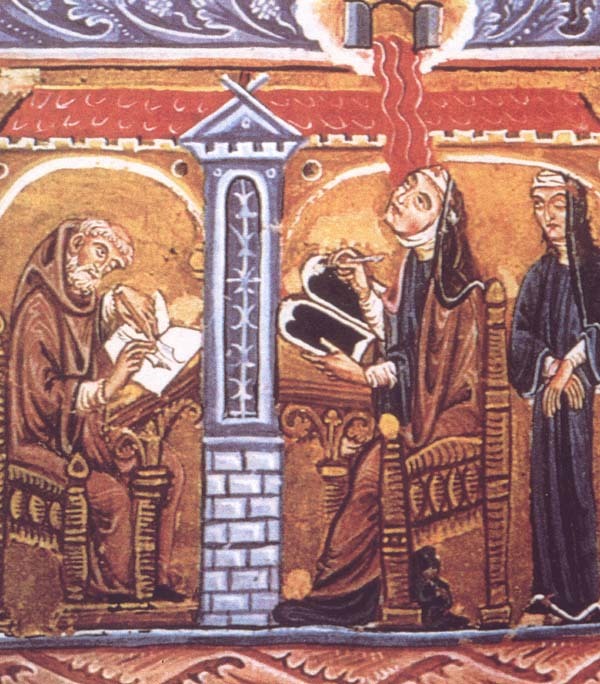 I was inspired to write chronograms to honor Hildegard by those composed by Sr. Walburga Storch, O.S.B., a nun of the Abbey of St. Hildegard in Eibingen, Germany, which appeared in Festschriften for the Sibyl of the Rhine in 1979 and 1998.